I am finally back to my blog, It is been awhile since I posted last time. Busy holiday season just took a priority, haha. But I am back with bunch of new projects and ideas. But first - the exiting news! 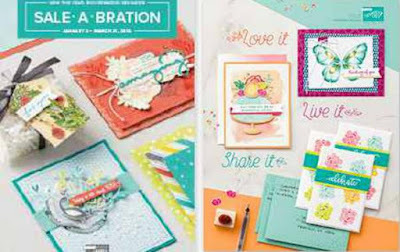 Today is a day - new Occasions Catalog is Live. New products is already super exiting news, but wait, there is more. 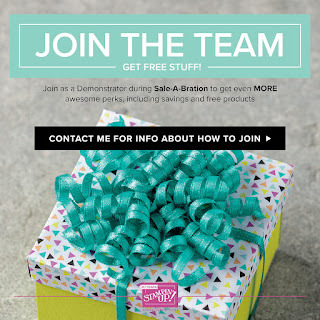 Today the Sale-A-Bration starts. You will earn free stamp or accessories from SAB catalog with $50 purchase. Check all fabulous choices HERE. It is the best time to join Stampin Up! family and my Fun Stampers team. For only $99 you can choose $125 worse of products, free shipping and 2 Free stamps (any value!). Visit my store to see all new products.